Reference number for this case: 13-nov-54-Buchy. Thank you for including this reference number in any correspondence with me regarding this case. The regional newspaper Le Courrier Cauchois, of Yvetot, quoted on November 23, 1954, a letter from one Mr. R. L., "totally worthy of faith", as it came from a well-known personality of Rouen, "who is not considered to be gullible." The man said that in the night from Friday to Saturday around 2 a.m., he was returning from Buchy driving his 4 CV car, and was preparing to engage on the National Road 28 which goes from Neufchatel to Rouen. He had passed the railway crossing by 500-meter when he suddenly saw a light that seemed to be parked on the right side of the road, about a hundred meters ahead of him. Immediately, the "thing" took off and departed to the north, but instead of rising vertically, "as usually, the craft seemed to oscillate a few meters above the ground. The gleam, of a greenish white, was regularly intermittent and seemed to precede a dark mass which seemed to progress by jumps at a speed that I estimate about 150 km/hour." When he arrived at th level where the craft was supposed to be when he saw it initially, he felt "like paralyzed", and from 90 km per hour, the speed at which he was driving, he had to slow down to the second gear, without being aware of slowing down voluntarily. The man said that he does "not claim to have been subjected to an external influence, but not being accustomed to be impressed by nothing, I cannot explain such an effect of 'inhibition'..."
Some sources indicate that the case was also published in the newspaper Paris-Normandie for November 15, 1954, i.e. 8 days before. Then, in 1956, the science-fiction writer and pioneering ufologist Jimmy Guieu reported that he knew the witness of this sighting personally, he was his friend. Guieu said he considered him to be a solid man, absolutely sincere, who was scared but did not panic. Guieu gives a story which is for word by word that of R. L.'s letter to the newspaper, adding simply that when the luminous object had moved away and finally disappeared, the witness was able to drive normally again. Guieu also added that at the time the witness had felt "paralyzed", he had "experienced a curious tingle all over his body". "I had exceeded the level crossing by 500 meters approximately when I suddenly saw a gleam, which seemed to station on the right edge of the road, at a hundred meters in front of me. At once, the "thing" took off and flees towards the north, but instead of rising vertically, as usual, the craft seemed to undulate at a few meters of the ground. The gleam, of a greenish white, was regularly intermittent and seemed to precede a dark mass which seemed to progress by jumps at a speed that I estimate about 150 km/hour. "Arriving at the level where the machine was when I saw it, I do not know what occurs, but I felt like paralyzed, and from 90 km per hour, the speed at which I drove, I soon had to go in second gear, without having been aware that I voluntarily slowed down. This testimony is totally worthy of faith as it comes from a personality extremely well-known from Rouen, who is not considered to be gullible. 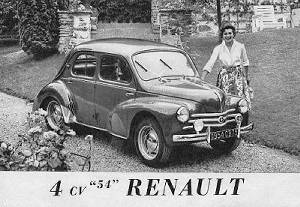 At 2 o'clock in the morning of Saturday, November 13, 1954, he was returning from Buchy in the Seine-Maritime at the wheel of his 4CV car and was on the point of getting on national road RN 28 from Neufchatel to Rouen. He had exceeded the railway crossing of 500 meters approximately when he suddenly saw a gleam, that seemed to be posed on the right side of the road at a hundred meters in front of him. The thing took off at once and fled towards the north, without rising vertically, but undulating at a few meters above ground-level. It was a gleam of a white greenish which was regularly intermittent and seemed to precede a dark mass while appearing to progress by jumps at a speed that he estimated as of 150 km/h. When he arrived at the level where the machine was when he first saw it, he did not understand what occurred when he felt strange tickling on all his body and felt like paralyzed. He had driven at 90 km/h but he had to go in second gear, without being aware to have voluntarily slowed down. The luminous object moved away, ended up disappearing and he could drive normally again. The author indicates that on November 13, 1954 in the Seine-Maritime, R.L. in a car sees a craft taking off with an intermittent white-greenish gleam at 100 meters in front of him at the edge of the road. When he arrives at the level where the craft had been he feels prickling and an effect of paralysis. The source is indicated as "G. II. p. 170." Jacques Vallée indicates that on November 13, 1954, close to Buchy, a luminous apparatus flew away while the witnesses were paralyzed and felt tingling. The engine of their car slowed down, but did not stall. This ufologist listed in a table a case in Buchy in department 76, with the source Flying Saucer Review 182. [FSR did not use this type of numbering, it is a case number]. Nov. 13, 1954 Buchy (France). At intersection of Routes N28 and N319, Mr. R. L., of Rouen, saw a luminous craft take off while he felt tickling and was paralyzed. The engine of the car slowed down but did not stall. (Quincy). Witness M. R. L., Rouen personality and acquaintance of J. Guieu. The witness was traveling in a 4 cv on the N28 when he saw a glow that seemed to be parked on the right side of the road. An object flew away and disappeared to the north. Arriving at the spot where the object must have been parked, the witness felt tingling throughout the body, was almost "paralyzed" and his car was inexplicably slowed down. G .2 p. 170- V.c # 337. NOTE: At present, this case is a unique case of delayed "paralysis". For "impossible" that such a state of affairs may appear, there can be no question of denying it outright. A thorough investigation is required. At the intersection of the roads RN 28 and RN 319, Mr. R.L., of Rouen, saw a luminous machine taking off, he then felt tickling and was paralyzed. His car's engine had slowed down but did not stop. The witness felt tingling and was paralyzed. We stop here this "catalog" that we voluntarily limited to the phenomena of type 1 (Vallée Classification) which took place on the French soil for the year 1954 only. The two authors indicate that on November 13, 1954, at 2 hours of the morning, Mr. R.L., a personality of Rouen and a relation of the ufologist and science-fiction writer Jimmy Guieu returned in a 4CV car from Buchy on the secondary road D 919 and was on the point of starting on national road RN 28 from Neufchatel to Rouen and had just exceeded a railway crossing of 500 meters approximately, when he saw a white greenish gleam which seemed to be posed on the right edge of the road at a hundred meters of him. That took off at once while undulating, at a few meters of the ground. The gleam is regularly intermittent and seems to precede a dark mass which advances by jumps at a speed that he estimated as of 150 km/h. At the time when he arrived at the level of the landing spot, he felt strange tickling on all the body and felt paralyzed. "from 90 km/h, the speed at which he drove, he had to go in second gear, without to have been aware to have voluntarily slowed down." The object moved away and all was normal again. The authors quote Jacques Vallée, Jimmy Guieu, Guy Quincy and the newspaper Paris-Normandie for November 15, 1954, as sources. In the classifieds of the LDLN magazine, it is indicated that ufologist Christian Soudet is looking for documents in order to establish a regional catalog, and notes among other things that he is looking for an article from the newspaper "Paris-Normandie for 11/15/54". related to the Buchy case of November 13, 1954. Resting on the ground next to the intersection of Routes N28 and N319 at Rouen, France, was a luminous object that gave off flickering green-white rays of light. A motorist with the initials "R.L.," had trouble with his car's electric system as his vehicle passed the UFO. Although the engine missed a lot, it did not completely fail. The driver experienced paralysis and a prickling sensation. 51. 51. Rogerson, Peter. "INTCAT Part 10." MUFOB. New Series 5, Winter 76-77. #36. p.9. Two witnesses observed a luminous object rise from the ground. They felt prickling on their skin and were paralyzed. The car's engine slowed but did not fail. The Belgian ufologist indicates that on November 13, 1954 in France in Buchy "At the intersection of roads N 28 and N 319 the witness saw a luminous machine which took off. He then felt tickling and was paralyzed. His car's engine slowed down but did not stall." The sources are indicated as "Quincy" and "Jacques Vallée: 'Chronique des apparitions ET' - DENOEL 1972 - J'AI LU COLL. - p. 292". France, Buchy: At intersection of Routes N28 and N319, Mr. R. L., of Rouen, saw a luminous craft takeoff while he feIt prickling and was paralyzed. The engine of the car slowed down but did not stall. BUCHY,FR:CAR SLOWS:LUMn OBJ LANDS+TAKES OFF:OBS PARALYZED BRIEFLY:/r79p5. In Buchy (France), at the intersection of the roads N28 and N319, Mr. R.L., of Rouen, sees 1 luminous machine which takes off. He then feels prickling and is paralyzed. The engine of his car slows down but does not stall. Luc Chastan indicates that in the Seine Maritime in Buchy on November 13, 1954, at 02:00 hours, "the witness drives by the car on the D919. He is on the point of starting on the N28 from Neuchâtel to Rouen. He has just passed a railway crossing by 500 m when he sees a greenish white gleam which seems to station on the right edge of the road a hundred meters in front of him. At once the object takes off while undulating at a few meters of the ground. The gleam is intermittent and seems to precede a dark mass which advances by jumps at a speed that the witness estimates as 150 km/h. Arriving at the height of the landing spot, the witness feels tickling on all the body and feels paralyzed. The car slows down without the witness being conscious to slow down. The object moves away and all becomes normal again." The website indicates that on 13 November 1954 in Buchy, France, "At intersection of Routes N28 and N319, Mr. R. L, of Rouen, saw a luminous craft take off while he felt prickling and was paralyzed. The engine of the car slowed down but did not stall." The website indicates that on 13 November 1954 at 03:30 on the RN28, near Buchy River, France, "An object was observed. Electromagnetic and physiological effects were noted. One luminous object was observed by one male witness on a highway." The sources are indicated as Guieu, Jimmy, Flying Saucers Come from Another World, Citadel, New York, 1956; Bowen, Charles, The Humanoids: FSR Special Edition No. 1, FSR, London, 1966; Vallee, Jacques, Computerized Catalog (N = 3073); Vallee, Jacques, Challenge to Science: The UFO Enigma, Henry Regnery, Chicago, 1966; Vallee, Jacques, Preliminary Catalog (N = 500), (in JVallee01); Vallee, Jacques, A Century of Landings (N = 923), (in JVallee04), Chicago, 1969; Schoenherr, Luis, Computerized Catalog (N = 3173); Carrouges, Michel, Les Apparitions de Martiens, Fayard, Paris, 1963; Rodeghier, Mark, UFO Reports Involving Vehicle Interference, CUFOS, Chicago, 1981; Falla, Geoffrey, Vehicle Interference Project, BUFORA, London, 1979; Hatch, Larry, *U* computer database, Author, Redwood City, 2002. At intersection of Routes N28 and N319, Mr. R. L., of Rouen, saw a luminous craft take off while he feIt prickling and was paralyzed. The engine of the car slowed down but did not stall. The date is given in Le Courier Cauchois for November 23, 1954 as being "in the night from Friday to Saturday around 2 am", which would mean November 20, 1954. But apparently, the case had been reported already in Paris-Normandie on November 15, 1954, source which I do not have yet. The date would be then, if one preserves the "in the night of Friday to Saturday towards 2 am" given in the witness letter as quoted in Le Courrier Cauchois, Saturday, November 13, 1954, the date given in all the ufological sources. This tends to prove that there was indeed an article about the case in Paris-Normandie on the 15th, otherwise everyone would have dated the case to the 20th. Peter Rogerson, an ufologist who became "skeptical", in 2016 [pr2] notes my proposal for a mistake by a helicopter I made in 2006, but suggests as the first alternative that the witness would have mistaken the moon for a UFO. This happens indeed, but in this case, at this date and time and place, the moon was at an elevation of 61° in the sky. (0°, it would be the moon on the horizon, 90°, it would be the moon over the witness' head.) Now, on the one hand lunar misunderstandings occur most often with a low moon, rarely with a moon high in the sky, and secondly, Mr. RL sees his object as being on the ground (let's not even mention its takeoff, the intermittent light, greenish! (*) etc. I think therefore that Peter Rogerson is wrong, and that he did not even consult a sky map - which is something to do in ufology. (*) Reminder: "...the craft seemed to undulate at a few meters of the ground. The gleam, of a greenish white, was regularly intermittent and seemed to precede a dark mass which seemed to progress by jumps at a speed that I estimate about 150 km/hour." He sais he had just entered National Road 28; which does not exist anymore, it is now highway A 28, alias "route des Estuaires",. Of course it is not certain, although likely, that A28 used the same path as RN 28. He also said to have exceeded the railway crossing by about 500 meters. 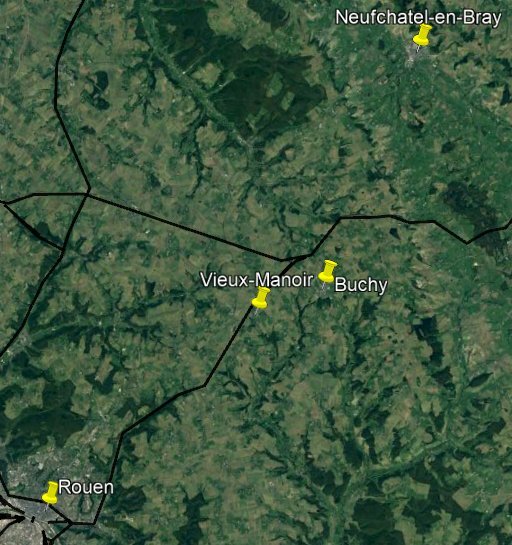 Only one place on the A 28 coming from Neufchatel and going towards Rouen cuts a railway line, one can find the observatioj spot 500 meters further. It is 5 km north-northwest of Vieux-Manoir. Black line: the railway. Blue dot: the railway crossing. Yellow line: 500 meters. Red dot: place where the witness first saw the UFO. 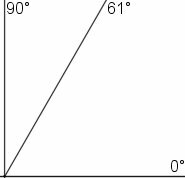 The witness then drives in the direction 158°, the road keeping this direction in a straight line for almost two kilometers. 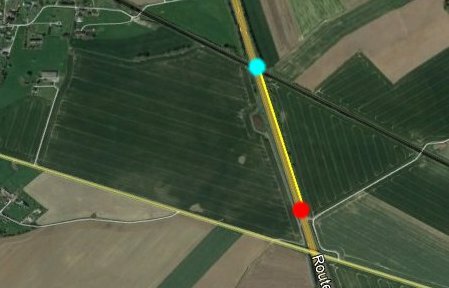 The witness located the UFO at 100 meters (this is not reliable), in front of him on the right side of the road (this is reliable). The UFO was therefore in the 158° direction, while the moon is at 127°, which is 30° to the left of the road. And the UFO goes away to the "north," and it "seemed to oscillate at a few meters above the ground." It does not coincide with the moon. Peter Rogerson points out that the witness was a friend of Jimmy Guieu - it is Guieu himself who tells this - and that it could be a hoax. I am not very convinced. On the one hand, if it is true that Guieu supported known witnesses hoaxes, and started to tell much nonsense, this was all in the years 1970 to 2000, I have no example of inventions by Guieu in the 1950s. There were so many convincing (at least for him) saucer reports anyway in those years that I do not see any need to invent more of them. On the other hand, for an invention, if this was made up, it is not a very impressive invention, as the description of events by the witness made me consider it was just a helicopter. [---] Article in the regional newspaper Paris-Normandie, Rouen, France, November 15, 1954. [cc1] Article in the regional newspaper Le Courrier Cauchois, Yvetot, France, November 23, 1954. [jg1] "Black-Out sur les Soucoupes Volantes", book by Jimmy Guieu, Omnium Littéraire publisher, pp 194-195, 1956. [---] "Catalogue Spécial Annoté des Atterrissages", compiled by Guy Quincy, typewritten , unpublished, France, 1961. [mc1] "Les Apparitions de Martiens", book by Michel Carrouges, aka Louis Couturier, Fayard publisher, France, page 129, 1963. [jv1] "The Pattern Behind UFO Landings", chapter by Jacques Vallée, in "The Humanoids", book by Charles Bowen, Neville Spearman publisher, 1967. [fl1] "Corrélation M.O.C. et failles", article by Fernand Lagarde, in the ufology magazine Lumières Dams La Nuit (LDLN), France, #98, page 14, February 1969. [ga1] "La 'Paralysie'", articleby the G.A.B.R.I.E.L. ufology group, in the ufology magazine Ouranos, France, Numéro Spécial 1, page 4, 4th quarter 1973. [jv1] "Le Modèle Derrière les Atterrissages d'OVNIS", chapter by Jacques Vallée, in "En Quête des Humanoïdes", book by Charles Bowen, French translation of "The Humanoids", J'ai Lu publisher, France, page 67, 1974. [gl1] "Face aux Extra-Terrestres", book by Charles Garreau and Raymond Lavier, Delarge publisher, J'ai Lu, France, pp 91-92, 1975. [ga2] "Cinq plus un... ou la boucle bouclée", article by the G.A.B.R.I.E.L. ufology group, in the ufology magazine Ouranos, France, Nouvelle Série N° 9, page 8, 4th quarter 1976. [---] "INTCAT Part 10", catalogue by Peter Rogerson, MUFOB, U-K., New Series 5, #36, page 9, Winter 1976-1977. [---] "Vehicle Interference Project", compiled by Geoffrey Falla, British UFO Research Association (BUFORA), U-K., 1979. [mr1] "UFO Reports Involving Vehicle Interference", compiled by Mark Rodeghier, Center for UFO Studies (CUFOS), USA, page 5, 1981. [mf1] "Catalogue Francat des rencontres rapprochées en France (Listing 800 1982) (2 - Suite)", list compiled by Michel Figuet, in the ufology magazine Lumières Dans La Nuit (LDLN), France, #257-258, page 21, November - December 1985. [cs1] Annonces, dans le magazine d'ufologie Lumières Dans La Nuit (LDLN), France, N° 295, page 39, janvier - février 1989. [lg1] "The Fifth Horseman of the Apocalypse - UFOs: A History - 1954 November - December", monography by Loren Gross, USA, page 20, 1991. [---] Ufology magazine Lumières Dans la Nuit (LDLN), France, #324, page 16, 1994. [js1] "UFO-Related Human Physiological Effects", by John F. Schuessler, in "Physical Evidence Related to UFO Reports, The Proceedings of a Workshop Held at the Pocantico Conference Center, Tarrytown, New York September 29 – October 4, 1997", published by the Journal of Scientific Exploration, 1997. 0.1 Patrick Gross October 22, 2006 First published. 1.0 Patrick Gross June 11, 2009 Conversion from HTML to XHTML Strict. First formal version. Additions [go1], [jb1], [lc1], [ud1], [ud2]. 1.1 Patrick Gross December 24, 2009 Addition [mc1]. 1.2 Patrick Gross July 1, 2010 Addition [jv5]. 1.4 Patrick Gross October 28, 2011 Addition [cc1], [bu1], [ed1]. 1.5 Patrick Gross November 22, 2016 Additions [lg1], [ta1], [ub1]. 1.4 Patrick Gross November 27, 2018 Additions [fl1], [ga1], [ga2], [mr1], [mf1], [cs1], [lh1], [pr2]. Addition of the Summary. Explanations chaged, were "Not looked for yet. Possible helicopter."